These suggested walks are designed for the part of the year when wildlife is active, roughly between late March and October. Wildlife is seasonal and what you might see will depend on the time of year. In winter most wildlife is absent, so the walk may still be enjoyable, but you will not see as much wildlife. Click the Green links to go to the route page where you will find a map and guide points. Starting from Widdington TL538317. A walk of about three and a quarter miles through green lanes, ancient woodland and passing by summer wildflower meadows. Start Point New Street Car Park, Map ref TL629218, Distance 3.75 miles. Allow 4 hours. The walk leads out of Great Dunmow to follow the Flitch Way through Dunmow Cutting, with its wildflowers and butterflies, returning through agricultural land and past woodland. A walk just outside the boundary of Uttlesford to see the Oxlip and the countryside around Great Bardfield. OS Explorer Sheet 195. Starting from the centre of the village, a walk of about 3 and a half miles. OS Reference TL677305. Take the walk in April to see the Oxlip in flower. Stansted Mountfitchet and the Aubrey Buxton nature reserve. A walk of about four miles to see the countryside around Stansted, with a visit to the Essex Wildlife Trust Aubrey Buxton Nature Reserve. OS Explorer Sheet 195. Starting from the car park by the castle and railway in the centre of the village. OS Reference TL517249. Bishops Stortford and the Rushy Mead nature reserve. A walk of about four miles from the centre of Bishops Stortford along the River Stort path to the Essex Wildlife Trust Rushy Mead Nature Reserve. Thaxted to the West Wood nature reserve. A walk of about four miles from the centre of Thaxted to see the Essex Wildlife Trust West Wood Nature Reserve. Stansted Mountfitchet to the Turners Spring nature reserve. 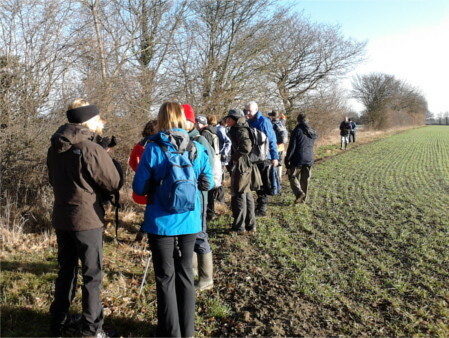 A walk of about three and a half miles from the centre of Stansted to see the Essex Wildlife Trust Turners Spring Nature Reserve. Other Walks are available, the following website lists lots of walks and has an OS map that you can save and print with the route on. Worth a look.